Lexington, KY – July 25, 2015 – Saturday night at the Kentucky Horse Park ushered in hundreds of spectators for Hats Off Day and one of Sydney Shulman’s biggest career grand prix wins. The 20-year-old and her mount Venice bested a field of 36 horse-and-rider combinations to win the $50,000 Rood and Riddle Kentucky Grand Prix at the Kentucky Summer Horse Show. From the original starting field, only three riders successfully maneuvered the first round, Alan Wade-designed course without penalty to advance to the jump-off. The others all fell victim to faults both over the fences and on the clock – including 15 combinations who finished with at least one time fault. Three riders, including Alison Robitaille, Conor O’Regan and Ansgar Holtgers, all finished clear over the fences but faced heartbreaking time faults as they tripped the timers, keeping them from the second round. It was only Shane Sweetnam and Easy Contact Humlan, Shulman and Venice, and Sharn Wordley and Corino who would successfully advance to the jump-off and vie for the lion shares of the prize money in front of the packed stands in Rolex Stadium. As the early pathfinders, Sweetnam and Easy Contact Humlan, owned by Sweet Oak Farm, were the first to contest the short course, and they turned in an impressive double clear effort to finish on a time of 47.238 seconds. Shulman and Venice, owned by Jill Shulman, returned next, and from halfway through the course it was apparent that they were gunning for it. As they crossed the finish, their time flashed 44.823 seconds, nearly three full seconds ahead of Sweetnam’s time to move them into the lead. “I didn’t have a very good jump-off in the welcome class on [Venice], so I was a little skeptical going back in today,” Shulman said. “She’s super quick across the ground; she doesn’t spend much time in the air. Her strides not big so I know I can make up time in the turns because she’s careful. “I said to everyone before I went in, ‘I’m going to play it safe to the double,’ because that’s where I messed up on Thursday, but then I saw it. She felt really good, and I think I made it up there and at the liverpool. Then I took a shot to the last,” Shulman said. From there it all came down to Wordley and his own Corino. But as a rail fell out of the cups, Wordley elected to retire, knowing that he would still finish in third, and the victory was Shulman’s. Shulman looks forward to coming to the Kentucky Summer Horse Shows every year, and she and Venice will return to competition next week during the Kentucky Summer Classic. 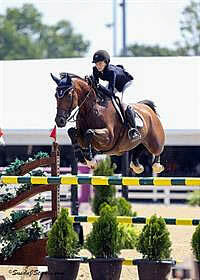 The Kentucky Summer Horse Show concludes on Sunday with jumper competition resuming at 8 a.m. in the Rolex Stadium. 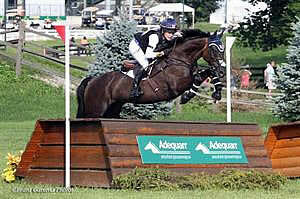 Young rider Vivian Yowan proves time after time that she can do it all, whether she’s riding her way to individual gold at the North American and Junior Young Rider Championships (NAJYRC), winning in the jumper ring or claiming top honors in the hunters at the Kentucky Summer Horse Show. As the Small Junior 16-17 Hunters began, Yowan and her own Ransom came ready to win, delivering two smooth rounds to boost them to the top of the pack. Scores of 89 and 88 earned the duo both blue ribbons over fences, with a fifth place finish in the under saddle rounding out their scorecard. Yowan’s second mount in the division, Anytime, is a new ride for her. Despite being new partners, Yowan and Anytime impressed the judges, finishing second and fourth with scores of 85 and 81. Earlier in the day, the Large Junior 16-17 Hunters were underway in the Stonelea Ring, with rider Tyler Petrie outshining the field of top hunters on her two entries, Curious George and Quite Ruffy 840. Petrie and Quite Ruffy 840, owned by Pamela Kahn, scored an 86 to collect the blue ribbon in the first over-fences class, with second place going to Yowan and Belhaven Stables LLC’s Character. Petrie and Quite Ruffy 840 followed up with another 86 to finish second in the next round. A third place finish on the flat marked a successful day for the duo. The second class went to Petrie and Curious George, who Petrie is riding in place of his owner, Lucy Loper, who is recovering from a broken back. The duo’s score of 87 gave them a slight edge over Quite Ruffy 840 to take the top spot. 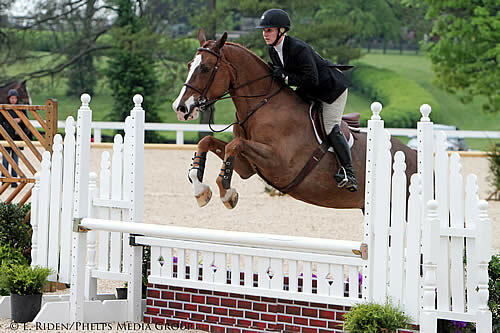 In addition to a full range of hunter divisions, hunter competition at the Kentucky Summer Classic culminates in Sunday’s $5,000 USHJA National Hunter Derby. Lexington, Ky. – Show jumping competition at the 2015 Adequan/FEI North American Junior & Young Rider Championships (NAJYRC) presented by Gotham North came to a close on Saturday with the awarding of the Individual medals. Riding away with Gold were Vivian Yowan in the Junior division and Lucy Deslauriers in the Young Rider division. The USDF/Platinum Performance North American Junior and Young Rider Dressage Championships also concluded on Saturday at the Kentucky Horse Park with the Dressage Freestyle competition. Bebe Davis earned the Gold medal score in the Junior division and Naima Moreira Laliberte took the top position atop the podium in the Young Riders. Para-dressage awarded the first medals in the discipline’s inaugural year at NAJYRC with the presentation of Individual and Team medals. On Sunday the riders will vie for Freestyle medals. The final of the four disciplines competing on Saturday, eventing, completed the cross-country phase, and eventing riders will return on Sunday for their show jumping phase. During the USHJA North American Junior and Young Rider Show Jumping Championships at the NAJYRC, Individual show jumping riders compete over five total rounds. By the end of the final round, Vivian Yowan (17, Lexington, Ky.) had managed to complete all five courses without a single rail rolling out of the cups with Vornado Van Den Hoendrik, securing her the Junior Individual Gold medal. Yowan, of Zone 5, crossed the timers on Saturday with one single time fault. This added with her 3.08 coefficient score from the first round gave her a final total of 4.08. Her consistency throughout the three days of competition is something that Yowan worked hard on following her first NAJYRC appearance last year. Also showing great consistency throughout the week was Mexico’s Juan Pablo Gaspar Albanez (17, Guadalajara, Mexico). Albanez kicked off the week by winning Wednesday’s opening round, and on Saturday he rode to a final score of 8.00 to win the Silver medal. At 17 years old, Albanez will have another go at the Junior Gold next year, as will this year’s Bronze medal winner, Sophie Simpson (17, Royal Palm Beach, Fla.). In the Young Rider Individual Championship, the race for the Gold medal came down to less than one single time fault. Going into the fifth and final round of competition, Brittni Raflowitz (20, Palm City, Fla.) and Noel Fauntleroy (20, Manakin-Sabot, Va.) sat neck-and-neck with scores of 4.15 and 3.49, respectively. Sitting in third with a score of 8.04 was Lucy Deslauriers (16, New York, N.Y.) who had moved up from the fifth place position going into the day. As the riders came back in reverse order of their standings, Deslauriers and her mount, Hester, delivered. They crossed the timers with just one time fault, giving them a total score of 9.04 and guaranteeing that they would finish no worse than Bronze. After already turning in an impressive three clear rounds throughout the week, Raflowitz and Baloumina Du Ry finished the final round with five faults. Those faults positioned her nearly just one-tenth of a point behind Deslauriers, finishing on 9.15 and guaranteeing her a medal. The 20-year-old was leading going into the final round, but she would have to settle for Bronze as two rails hit the ground, giving her a total score of 11.49. A Bronze at the NAJYRC is still an extremely impressive achievement, particularly as this year marks Fauntleroy’s first NAJYRC appearance. Similarly, Raflowitz was thrilled with her and her mare’s incredible performances throughout the week that put her in the Silver position. As for Deslauriers, the Gold medal makes the perfect addition to the Individual Silver medal she claimed last year, and she could not be happier. The top 18 Junior Individuals advanced to the Freestyle Championship on Saturday where they were judged by Brenda Minor at E, Marian Cunningham at H, Jayne Ayers at C, Anne Prain at M and Mercedes Campdera at B.
Bebe Davis (17, Wellington, Fla.) of Region 3 earned the highest Junior Freestyle score of the day with a 71.825% and secured the Gold medal. Helen Claire McNulty (15, Holland, Mich.) of Region 2 and Checkmate earned the Silver medal with a score of 71.725%. McNulty turned in a solid freestyle test, despite admitting to a slight change of plans part way through. The Bronze medal went to Camille Carier Bergeron (15, Mascouche, Que.) of British Columbia-Quebec. She and her mount Delfiano rode to a score of 71.375% in their freestyle test set to upbeat African-style music. On Friday, Naima Moreira Laliberte (18, Montreal, Que.) earned the Young Rider Individual Bronze medal, and on Saturday she returned to claim the Young Rider Freestyle Gold medal. Laliberte and her mount, Belafonte, earned a score of 71.825% in one of their first times performing their freestyle test together in full. The judges for the Young Rider class were Gabriel Armando at E, Lorraine Stubbs at H, Janet Foy at C, Ulrike Nivelle at M, and Cesar Torrente at B. The ground jury scored the combination of Hannah Bauer (16, Purcellville, Va.) and Trustful with a 70.000%, securing them the Silver medal. The Bronze medal went to Kerrigan Gluch (Mt. Pleasant, Mich.) who earned a score of 69.050% on Vacquero HGF. While the Team Para-Dressage championship took place on Thursday, the winners received both their Team and Individual medals on Saturday after also completing their Individual tests. Topping the podium in team competition was Team USA, with Team Canada taking the Silver. Beyond just being happy with their performances, all members of Team USA were excited to see para-dressage added to the disciplines offered at the NAJYRC. Kaylor finished with the Individual Silver medal in the Grade 1b competition, earning scores of 62.65% in the Team test and 61.509% in the Individual test for a 124.16 total. Earning the Individual Gold medal in the 1b competition was Kaylor’s teammate, Collier. Collier received scores of 67.65% and 67.112% for a cumulative total of 134.76. The third member of Team USA, Shoemaker, received the Individual Gold in Grade III with scores of 66.02% and 68.079% for a 134.099 total. Godin-Keating and Mr. Itchy earned the Gold in Grade 1a on scores of 63.315% and 61.902%, Cummings captured Gold in Grade II with West Bay on scores of 61.397% and 61.464%, and Lawson claimed the Gold in Grade IV on Lawrence, earning scores of 66.815% and 65.298%. Para-dressage riders return on Sunday to complete their Freestyle tests and vie for Freestyle medals. In the Individual competition, Grover-Dodge and Remington XXV lead the field, followed by teammate Booth and Twizzel. Sitting is third is Madison Temkin (14, Sonoma, Calif.) of Area VI and Kingslee with a score of 45.2. In the CCIYR2* division, Diane Portwood (19, Marrieta, Ga.) of Area III moved into the Individual lead Saturday on Cinerescent a double clear cross-country round, maintaining their dressage score of 60.5. Nicole Doolittle (17, Reddick, Fla.) and Tops, who led the after dressage, slipped into second individually after 20.8 time faults on cross-country, for a total of 68.5. Paige Pence (16, Louisville, Ky.) and Class Action, with 18.4 time faults, stand in third (78.0 total). The show jumping phase of eventing takes place tomorrow, the final day of the competition, followed by the medal ceremonies. For full results or to learn more about the Adequan/FEI North American Junior & Young Rider Championships, presented by Gotham North, please visit www.youngriders.org. Lexington, KY – May 17, 2015 – For 17-year-old Vivian Yowan, Kentucky is home. The local resident of the Bluegrass State has captured multiple wins over the years, from the ponies to the Junior Hunters, as well as even riding to the top of the Junior Jumper leader board. Today, in the Stonelea Arena on the final day of the Kentucky Spring Classic, Yowan once again impressed the judges to capture three tricolors in the Large and Small 16-17 Junior Hunter divisions, as well as the Junior/Amateur-Owner Hunter Grand Championship, sponsored by Visse Wedell of Douglas Elliman Real Estate. Yowan showed Ransom to two blue ribbons on Saturday during the Small 16-17 Junior Hunter division, and duplicated her efforts today to take the first place finish in the handy and the under saddle with her talented mount. Ransom was not the only horse that impressed the judges over the two days of Junior Hunter competition. Yowan also rode a new horse, Rookie, owned by Belhaven Stables LLC of Wellington, FL, to the reserve championship behind Ransom. Although the pair is a relatively new partnership, they claimed two second place ribbons on Saturday and returned on the final day of competition to close out the show with the first place over fences and the second in the handy round. During the Large 16-17 Junior Hunters, Yowan rode Character, owned by Belhaven Stables LLC, to the reserve championship with the first and two third place finished over fences, as well as the first place finish in the handy. It was 16-year-old Tyler Petrie of Moreland Hills, OH who rode to the division’s top honors to secure the championship tricolor with Quite Ruffy 840. Earlier in the day it was Annabel Revers and Kingpin who took the Small 15 and Under Junior Hunter Championship, while Emma Wujek and Chabilano Z finished out the week with the reserve championship. In the Large 15 and Under Junior Hunters Emma Kurtz and Fredrick were awarded the champion rosette, while Revers and Diplomat finished as the reserve champions of the division. The final day of the Kentucky Spring Classic concluded the two-week spring series with the Pony Hunter Grand Championship, sponsored by Visse Wedell of Douglas Elliman Real Estate. Emma Seving was awarded the Pony Hunter Grand Championship for her efforts in the Medium Pony Hunter division with her own Sassafras Creek. Today marked the end of the Kentucky Spring Classic, but the hunter and jumper competitions at the Kentucky Horse Park continue this summer with the Kentucky Summer Horse Shows, kicking off on July 22, 2015. Vivian Yowan and Vornado van den Hoendrik. Lexington, KY – May 8, 2015 – For Lexington native Vivian Yowan, the winner’s circle at the Kentucky Spring Horse Show is a familiar place. Today, the young talent returned to the Rolex Stadium with veteran mount Vornado van den Hoendrik, capturing the $1,500 High Amateur-Owner/Junior Jumper as the only double-clear combination of the class. Twenty-eight contenders took their try at Richard Jeffery’s High Amateur-Owner/Junior Jumper course. Only three would make it through to the jump-off, but as the trailblazer of the class, Yowan set the pace at 34.049 seconds with a faultless round, which would be good enough to take home the victory. “I was actually the first one to go in to the jump-off, so I didn’t know if anybody else would have a rail. I kind of just went for it, and obviously it paid off. I rode the jump-off like there would have been more double clears; it just kind of worked in my favor,” Yowan said. Where many of the riders saw the rails fall during the double and triple combinations, Yowan kept confidence in her 17-year-old mount, Vornado van den Hoendrik. During the jump-off, she caught the first jump and moved forward utilizing his large stride to cover the ground in seven strides instead of eight, which she had previously walked. Noel Fauntleroy of Manakin Sabot, Virginia and her mount Cabras rode to the second place finish with four faults in 36.210 seconds. Canada’s Veronica Bot and Calato’s Charles scooped up third place with their conservative effort of 38.950 seconds and four faults. Earlier in the day, the $5,000 1.45m Open Jumper division took center stage in the Rolex Stadium. Thirty horse-and-rider combinations attempted the same course as the High Amateur-Owner/Junior Jumpers, and only one pair would clear the opening track to score the victory – native Australian Scott Keach and Fedor. Second place was awarded to Juan Andres Rodriguez and Bugatti for their careful first round effort. The pair only earned two time faults, but it was enough room for Keach to take the victory. Keach has made Kentucky his summer home, returning for his third consecutive year. Now, with Tryon only five hours down the road, Lexington makes the perfect pit stop on his summer tour. The addition of the FEI competition to the spring shows has opened new doors for many of the riders, Keach admitted. The jumper action at the Kentucky Spring Horse Show will continue tomorrow with the $85,000 Mary Rena Murphy Grand Prix CSI2*, set to start at 6:30 p.m. in the Rolex Stadium. The $25,000 Bluegrass Classic and the $25,000 Under 25 Grand Prix will wrap up the first week of the Kentucky Spring Horse Show on Sunday. Lexington, KY – May 9, 2014 – As a Lexington native, Vivian Yowan is no stranger to competing and winning at the Kentucky Horse Park. Today, she added to her list of victories in her own backyard with a win in the ASPCA Maclay Horsemanship Class at the Kentucky Spring Horse Show. Yowan bested the field through an over fences and a flat phase to ride away with the win aboard Crackerjack, owned by Saddle Ridge, LLC. Finishing in second behind Yowan was Emma Kurtz aboard Scott Stewart’s VIP Z. Lizzie Van Der Walde rounded out the top three riding Gregor, owned by Dasilva Investments. While riding at the Kentucky Horse Park and in the equitation division is nothing new for Yowan, it is new domain for her winning mount, Crackerjack. 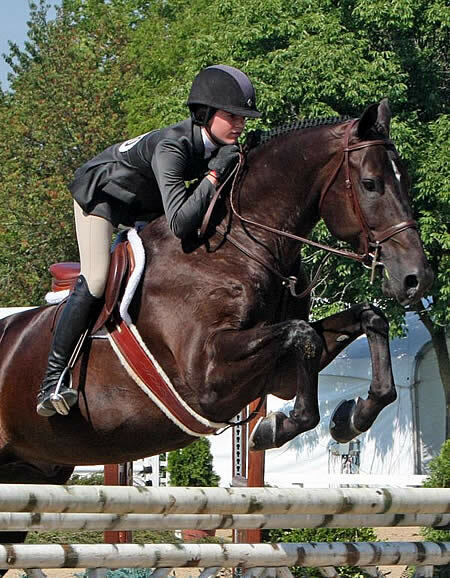 Yowan is also competing in the High Junior Jumpers throughout the two weeks of Kentucky Spring Horse Shows, but she places high value on the equitation classes. Yowan and Crackerjack also finished second in today’s Hunter Phase of the WIHS Equitation, while Kelli Cruciotti and Monterrey finished in first. Both riders will return for the WIHS jumper phase on Sunday at 8 a.m. When it comes to experience in the equitation ring, Rachel Boggus’ Papillon 136 is at the opposite end of the spectrum from Yowan’s Crackerjack. With Jessica Springsteen at the reins, the gelding won the 2008 ASPCA Maclay Finals, the 2009 Pessoa/USEF Hunt Seat Medal Final, the 2009 George Morris Excellence in Equitation class and countless other equitation classes leading up to the Finals. Now at 17 years old and with Boggus in the saddle, Papillon 136 has found a new division to excel in – the Adult Equitation. Boggus rode Papillon 136 to the win in today’s Ariat National Adult Medal. Boggus purchased Papillon 136 in November after she heard from Stacia Madden and Beacon Hill Farm that they were ready to step the older horse down from the 3’6″ equitation. The new pair hit it off, and they come to Kentucky off of a successful winter season at the Winter Equestrian Festival (WEF). Boggus now has her sights set firmly on this year’s Ariat National Adult Medal Finals, and if today’s performance was any indication, she has just the horse to take her there. Competition continues tomorrow at the Kentucky Spring Horse Show and includes this week’s hunter highlight classes: the $5,000 Hallway Feeds USHJA National Hunter Derby and the $15,000 USHJA International Hunter Derby beginning at 5 p.m. in the Rolex Stadium. Vivian Yowan finished first in the Pessoa/USEF Hunter Seat Medal aboard Sanderson, pictured, and first in the hunter phase of the WIHS Equitation Qualifier aboard Naf Naf. Photo by Emily Riden. Lexington, KY – May 17, 2013 – From May 15-19, 16-year-old Vivian Yowan enjoys the best of the best in junior equitation competition right in her own backyard. 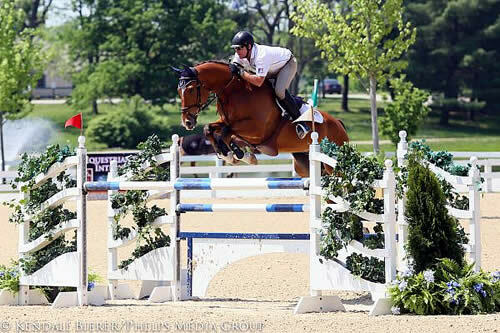 The Kentucky Spring Classic attracts junior riders from across the country to the Kentucky Horse Park, just miles away from Boggs Hill Farm, where Yowan trains with Tim and Kelly Goguen. Today on her home turf, Yowan topped the field in both the Pessoa/USEF Hunter Seat Medal, sponsored by Randolph College, and the WIHS Equitation Hunter Phase. The ten obstacle course for the Pessoa/USEF Hunter Seat Medal, designed by Bobby Murphy, opened over a straightforward line heading away from the in-gate, and it went on to test riders back and forth through tight turns and rollbacks. Yowan demonstrated her exceptional equitation over the course aboard Sanderson, to earn her a spot as one of four riders called back to test. Along with Yowan, Addison Piper, Spencer Smith and Lizzie Vanderwalde all returned to the ring to line up as the top four finishers following the first course. Judges asked that each rider go directly from their place in line to jump what was formerly fence three, a vertical off of the left lead. From there, riders were instructed to ride a bending line to another vertical across the diagonal and then maintain a counter-canter around the end of the ring leading toward another vertical away from the in-gate. Riders then executed a rollback to the left to one final fence toward the gate before coming to a halt in front of the fence lining the Stonelea Ring. Adding to the difficulty of the test, all riders were asked to drop their stirrup irons. Piper and Superfly, owned by Cavallo Farms, LLC of San Diego, CA, were the first to execute the four fence round. Piper rode Superfly through the shortened course without issue, providing an excellent example of how best to maneuver the test. Yowan was the next to be asked to showcase her abilities, and she need not have worried about just staying on. Yowan rode the test seamlessly, cementing her spot as one of the top riders in the class. Smith tested next without issue aboard Icarus, owned by Ashland Farms of Wellington, FL, and Vanderwalde rounded out the top four aboard App For That, owned by Dasilva Investments of Ann Arbor, MI. Following their tests it was Yowan who rode away with the blue ribbon, while Piper took the second place position, and Smith and Vanderwalde finished third and fourth respectively. While Sanderson is a new partner for Yowan, she’s seen similar success with her long-standing mount, Naf Naf, owned by Saddle Ridge LLC of Darien, CT.
“I’ve had him a long time so we have a great relationship built. He’s really lazy, but he has a big stride. Once you get him going he’s really fun to ride,” Yowan said of Naf Naf. It was aboard Naf Naf that Yowan picked up her first win of the day, finishing with a score of 89 in the WIHS Equitation Hunter Phase. The WIHS Equitation Qualifier class will conclude on Sunday, May 17 at 10 a.m. with the Jumper Phase. In addition to equitation classes, the Kentucky Spring Classic features a full array of hunter and jumper divisions. Hunter horses and riders take the spotlight tomorrow evening for the $5,000 Hallway Feeds USHJA National Hunter Derby, the second in the $50,000 Hallway Feeds USHJA National Hunter Derby Series, a seven event series that culminates with the $15,000 Leading Hunter Rider Awards. 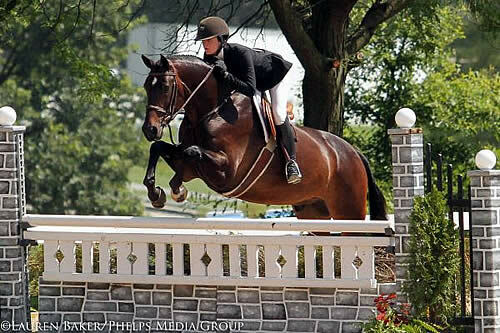 Lexington, KY – August 2, 2012 – The third day of the Kentucky Summer Classic welcomed Junior riders to the Stonelea Arena. The Kentucky Horse Park was alive with hunter action as the best horse and rider combinations competed for top honors during their respective divisions in the Small Junior 15 and Under Hunters, Small 16-17 Junior Hunters, Large 15 and Under Junior Hunters and Large 16-17 Junior Hunters. It was Vivian Yowan who made a first day impression, sweeping the Large 15 and Under Junior Hunters with Parker. Today, Vivian Yowan did not disappoint in the Small Junior Hunter divisions, shining aboard several top mounts. She rode two mounts to the peak of the standings in the Small 15 and Under Junior Hunters, securing the day’s top scores aboard Charming and Friday Night. Atop Charming, owned by Boggs Hill of Lexington, KY, Yowan rode to the blue ribbon in the first over fences. She also showed Friday Night, owned by KAR LLC of New York, NY, to the second place award just behind Charming, as well as the fourth place award for their efforts in the second round.